Can you believe it is almost the end of September? Where does the time go. I finally did another card for the Progressive Challenge 3 that is going on at the Crafter's Digital Art Center. This sunflower/butterfly digi image is by Just Ink Lined. I kept the card pretty simple to show off this beautiful digi. The sentiment is stamped on a Spellbinders Fancy Labels Two die. The vine is new to me, and is by Cherry Lyn Designs. Paper are DCWV. Butterfly is popped up. Colored with Copic Markers. pretty...I see so many sunflowers right now when I am out and about taking my doggie for a walk! Love 'em! 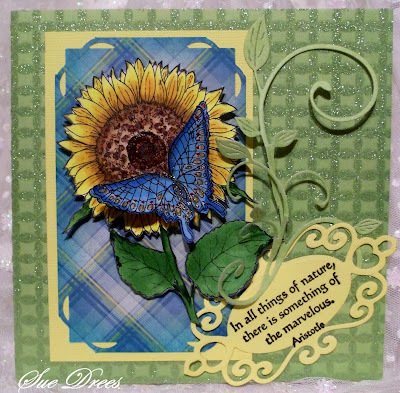 gorgeous sunflower, butterfly and card sue. Sue, What a fabulous card. Beautiful coloring and I love how you matted it. 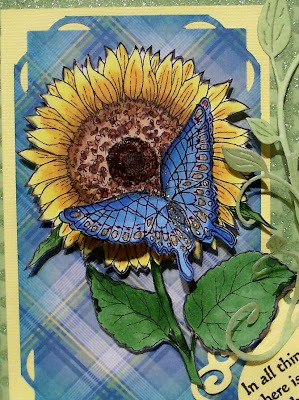 this is great, so beautiful, the butterfly and the sunflower, great collors!! Wonderful Sue! I love everything about it and the sentiment is perfect! Thanks for playing the CDAC progressive challenge! I love the sunflower and butterfly, two of my favorite things! Beautiful card, Sue!